NetQuarry is proud to announce that its summer internship program has returned for the fifth year since its inception in the summer of 2012. Our four interns this year come from a variety of schools and with differing backgrounds in computer science. George Whiteside is a rising junior at Vassar College in Poughkeepsie, NY and is majoring in computer science. Robbie Jones is a rising sophomore at Stanford University in Stanford, CA and is also majoring in computer science. 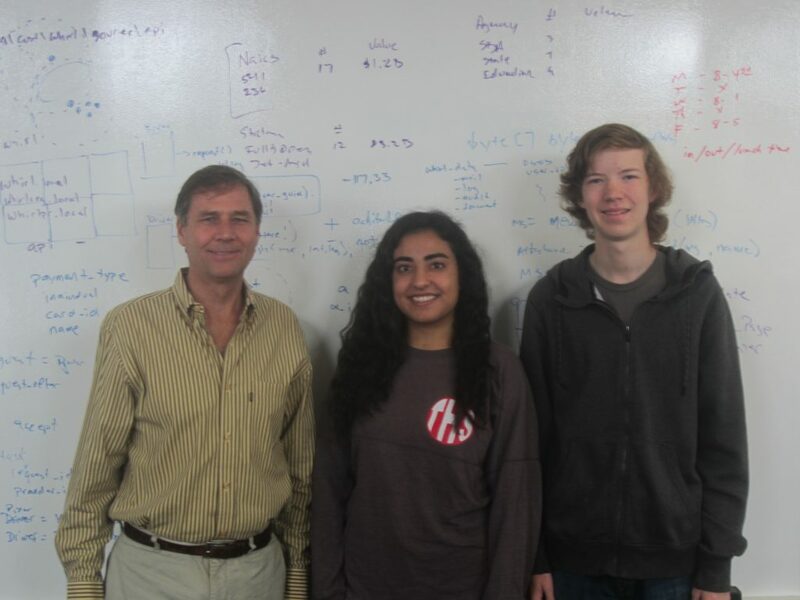 Tim Royston and Alexa Shahrestani are both students in the Troy Tech program located close to the NetQuarry office in Fullerton, CA and will begin their college search in the fall. Robbie Jones is also an alumnus of the Troy Tech program. (L-R) Our college interns Robbie Jones and George Whiteside. This year, after a crash course on the NetQuarry studio software and general development process, the interns worked on several different projects. Split into two teams, they worked in conjunction with full-time engineers on new and existing projects. Their contributions will be seen in the production releases of several products. By the end of the summer, the interns will have learned many valuable skills that they can apply in the classroom and in future careers in the industry. In particular, this summer internship will have exposed the interns to many topics beyond the foundations of computer science taught in a traditional major program. They will have learned how to build real-world applications that cater to the business needs of clients, as well as how to communicate, distribute work, and manage a shared code base as a part of a larger team. Managing existing code is a skill in itself, and not something that many students are exposed to. This internship will have given students a chance to maintain and revise code written by professionals. They will not only pick up tips and tricks from observing how a team of engineers solve a problem, but they will also develop a newfound appreciation for commenting and straightforward implementation. We are looking forward to a great summer and wish all of the interns the best in their future endeavors. For our fourth summer now, NetQuarry is proud to announce the return of its summer internship program. We have 4 summer interns this year working with us on software development related tasks, including constructing a new mobile app and maintaining and developing upon our database/web applications. One intern from last year has joined us again; he is a rising senior at Boston University. Another intern is a rising junior at USC. The other two interns are current Troy High School students, participating in their school’s required Tech internship program. Our interns work side-by-side with our staff, giving them the opportunity to learn from experienced workers and become part of a real, professional work environment. The lessons learned here expand upon what they’ve been taught in school, and give them an outlet to apply their knowledge in a constructive way; everything our interns do matter, and their effects can be seen in our products. After the internship has run its course, the experience gained and the knowledge that comes with it will become an essential part of our interns’ respective futures in the technology sector and will have provided a solid foundation upon which they can build the rest of their career. Knowing how to operate in and navigate the real world is just as important as learning the fundamentals of computer science in school, and together, they will lead to a successful future. FULLERTON, Calif. – June 22, 2015 – NetQuarry, Inc. announces release of v4.0.1 of its NetQuarry Enterprise Application Platform. This release is the first NetQuarry platform production release with support for the Bootstrap framework. As such, the primary focus of the release is to provide initial support for Bootstrap with no disruption to existing customers and applications. The intent is to allow initial development of new applications taking advantage of the Bootstrap framework in anticipation of more complete support in subsequent releases. Existing applications will function without modification and may be migrated in an upcoming release as migration tools are available. Built-in support for various date, time, and date/time pickers. Support for conditional environments on services. FULLERTON, Calif. – December 4, 2014 – NetQuarry, Inc. announces release of v4.0.0 of its NetQuarry Enterprise Application Platform. This release is the first NetQuarry platform production release built on .Net 4.0 and targeted for the .Net 4.0 framework. As such, the primary focus of the release is the framework conversion itself with as little disruption to existing customers and applications as possible. With the v4.0.0 release we are happy to be able to provide an extremely smooth migration path requiring only a recompile, a small number of standard .Net Web.config settings, and, for applications with integrated SQL-Server Reporting Services (SSRS) reports, a minor reference change to affected reports. Migration of existing platform code to .Net 4.0. Replacement of the original .Net installer with an InstallShield-based installer. Development of a .Net 2.0 to .Net 4.0 COM interop bridge for SSRS support. Updating of certain 3rd party components to .Net 4.0 compliant versions. Also included in this release are a somewhat small number of minor features and bug fixes. Hard to believe, but it’s been ten years since we started NetQuarry. We founded NetQuarry ten years ago today – September 24, 2004. By the middle of 2005 we were live with our first real customer, iLuxCars, which is still running today. In fact, I think all of the apps that we’ve deployed over those ten years are still running. Back in 2004 we started the NetQuarry platform on the latest version of .Net at the time, .Net 1.1, using VisualStudio 2003. Today the NetQuarry platform is developed using VisualStudio 2013 and is built for .Net 4.0 and along the way we’ve adopted various industry-standard technologies such as jQuery and Bootstrap, and adopted responsive design. Over the years the NetQuarry platform has grown to meet the needs of our customers and to keep up with the ever-changing demands of modern web-based applications. And, despite huge changes, the architecture of the platform has allows us to maintain an incredibly high level of backward compatibility – I’d say virtually 100% (for example, we have a customer who just recently upgraded their platform for the first time in a bit under four years with little more than a recompile). NetQuarry started as a boutique software engineering firm built around a cutting-edge, web-based platform with incredible dedication to our customers – and that’s what we remain today. Although we’ve grown a bit since then, the fundamentals haven’t changed one iota. NetQuarry remains 100% committed to our customers and to providing them with the very best technology available today. So, thank you to our customers, employees, interns and friends who have helped us get where we are today. FULLERTON, Calif. – August 18, 2014 – NetQuarry, Inc. announces release of v3.5.10 of its NetQuarry Enterprise Application Platform. This release is the final NetQuarry platform production release built on .Net 3.5 and targeted for the .Net 2.0 framework. The next production release,v4.0.0, is being built on .Net 4.0 and targeted for the .Net 4.0 framework and is expected to be released in early September. This release and the v4.0.0 release, focused on the framework conversion, are intended to serve as stepping stones to future versions of the platform built on the Net v4.0 framework. Although the .Net framework transition is the primary purpose, this release has a secondary focus on improved support for mobile devices and responsive design. Integrated support for phone and text messaging using Twilio. Improvements to Safari mobile support. 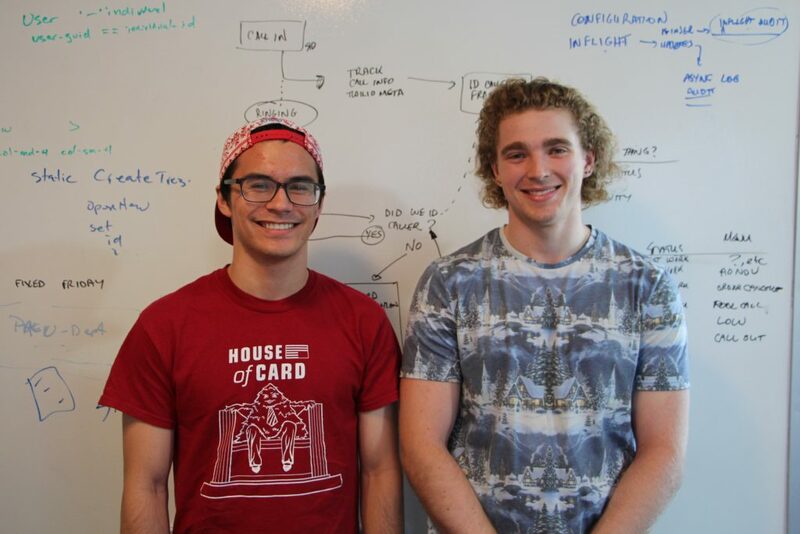 NetQuarry’s summer internship program is in full swing with its biggest year yet! A total of five interns are working together on a variety of basic software assignments on database applications and extensions, including creating surveys and organizing tables of newly imported information. With one returnee from last year, the five interns represent a diverse variety of backgrounds: one incoming senior participating in Troy High School’s Tech internship program, one graduated senior from Troy attending USC this fall, a returning junior to Boston University, a returning sophomore to USC, and finally a returning junior to Notre Dame. Alongside the staff here at NetQuarry, these interns will get a chance to be integrated into the NetQuarry team. Not only will they be contributing directly to the production and overall progress of the company, but they will also learn valuable hands-on lessons that few high school or college classes have the opportunity to teach. Now that the modern age upon us with software technologies advancing by the year, it is very difficult for newcomers in the industry to find stable ground and understand the nature of the profession. We hope this internship will be an important stepping stone for the futures of these interns as they enter into a technology-filled world. The Fullerton Five of Netquarry, Inc.
FULLERTON, Calif. – October 4, 2013 – NetQuarry, Inc. announces release of v3.5.9 of its NetQuarry Enterprise Application Platform. This release is primarily a maintenance release incorporating numerous bug fixes and customer-requested enhancements as well as full HTML5 and IE10 support. Support for insert row and selective edit in WizPhantomEditList.